I had a feeling Parks & Rec would win, but I’m a little surprised that The Office managed to sneak into second place. I guess there are still some out there who remember its glory days rather than its current mediocrity. The big question here: where are the 30 Rock fans?? This Week’s Poll: In honor of Halloween, I am going to present horror-related polls for the rest of the month. First up: a look back at one of the true masters of horror, John Carpenter. What is his best film? The iconic Halloween? The Thing with Kurt Russell’s legendary beard? Or perhaps cult favorite They Live? Due to his extensive filmography, I am allowing for TWO votes per person. And that’s a wrap for September. This month looks to be a little quieter for me, so expect more new material in the coming days/weeks. How about you guys? See anything good over the weekend? What are you voting for this week? Lot of John Carpenter’s work I still need to see. Of those on the list, I’ve only seen Halloween, Big Trouble in Little China, and Memoirs of an Invisible Man. I’m going to have to reluctantly leave Memoirs out of my top two, as I think the other films are better, but I do feel that it’s an underrated movie in Chevy Chase’s filmography. I still haven’t seen Memoirs myself, but now you’ve got me more curious to check it out. John Carpenter + Chevy Chase is an interesting combo. If I may recommend one to see next, I’d say go for They Live. It’s a blast from beginning to end with lots of great one-liners and the most epic fight imaginable between “Rowdy” Roddy Piper and Keith David. It’s so ridiculous that I can’t imagine someone *not* loving it. Yeah, They Live has been on my list for a while. Like you say, it’s sounds so ridiculous it’s got to be a lot of fun. Oh good, something Jerry didn’t screw up! Sweet. I loved Miami Connection. I podcasted on it a while ago. Just one vote this week? What would be your second pick? Interesting poll this week, love Big Trouble in Little China and Assault on Precinct 13 so you know what I’ll be voting 🙂 Still haven’t seen The Fog, worth it? I watched Prince of Darkness (1987) in September, the only thing I liked was the opening credits score, definitely the weakest John Carpenter film I’ve seen so far. The Fog is pretty decent — it’s a solid horror film, but not one of Carpenter’s best. Glad to see Assault on Precinct 13 get another vote! That’s probably my second favorite behind They Live, and it seems to get unfairly overlooked in his filmography. 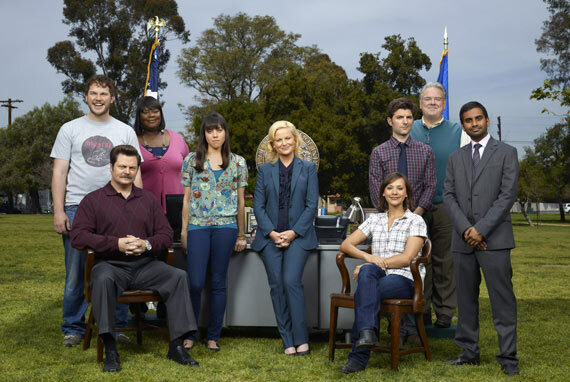 Parks & Rec is definitely worth seeing, especially if you are a fan of The Office! Ahhh yeah, forgot about that. That trailer looks pretty good so hopefully the show lives up to to the hype! I needed to vote! I didn’t get to vote! Can I vote for Community a few hundred times? Funniest thing on TV at the moment. Well, when it returns! Damnit…! Voted for The Thing and Memoirs of an Invisible Man. Mostly because I haven’t seen all too many Carpenters. But The Thing, which I only saw for the first time last year, I thought was a brilliant bit of horror. Amazing work there. And well Memoirs? I just love that film. Yeah, what’s up with Community? I thought the new season would have started by now. I wouldn’t be surprised if The Thing won this poll. It’s a classic for a reason. Ditto with Halloween.